Combining a beautifully rustic design with exceptionally high-quality materials, the Art 44-4 Globe Drinks Cabinet adds a touch of class to any occasion. Whether you’re hosting a few friends for dinner or catering for a party, this drinks storage solution takes sophistication to a whole new level and gives you the perfect conversation starter. Ensuring that you always have your drinks on hand is an important but challenging endeavour, especially if you have a habit of hosting regular dinner parties. This becomes even more difficult when you consider how much storage is required for a collection of high-quality beverages; fortunately, we have the perfect solution – our striking Globe Drinks Cabinet. Not only does the beautiful screen-printed cabinet store your drinks in the utmost style, but its wheeled nature enables your collection to travel around the house wherever and whenever you need it. Whether you’re enjoying an evening tipple or supplying drinks for your guests, our Globe Drinks Cabinet can help you every step of the way. The cabinet itself was designed with both practicality and curiosity in mind. Its three caster-wheeled legs allow it to traverse every terrain in your home and the chestnut-stained hardwood material serves as a sturdy base. Furthermore, as an added bonus, the 16-inch opening globe and its screen-printed 17th-Century replica map are perfect as a discussion piece or a handy icebreaker. Along with the practical applications of this stylish storage equipment, the Globe Drinks Cabinet is great at slotting into any home or business, regardless of décor or colour scheme. The spectacularly charming golden-brown shades seamlessly blend into almost all backgrounds, whilst still drawing the eye and making a unique feature display. 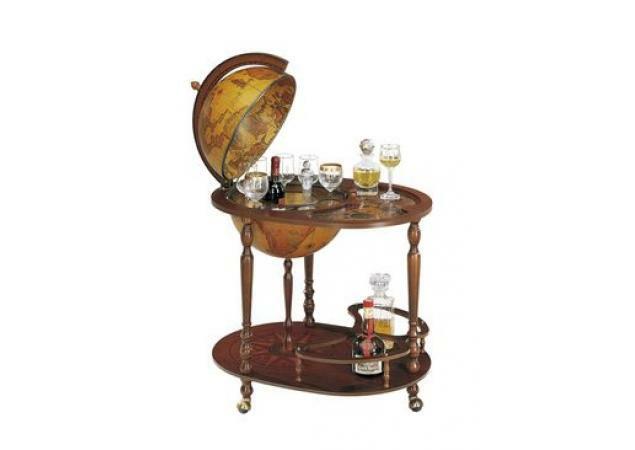 The Globe Drinks Cabinet is just one part of our wider contemporary wine rack collection. Featuring a range of materials and styles from light wood to chrome, if the Globe Drinks Cabinet isn’t quite large enough for you, we’re bound to have another drinks storage solution more suitable. We specialise in tailoring our solutions to our customers, building custom wine racks to your specifications if necessary. Whatever your requirements, get in touch with our bespoke service team on 01234 822977 and we’ll be happy to help. Alternatively, you can find out more about our custom-sized wine rack service here.